I met with friends early Sunday morning– the ones with whom I gather regularly to share coffee, joys, hurts and prayers. At the end of our time, I told one how burdened I sometimes feel by the act of pouring out to my children, as there’s always more to give and yet, still, I feel I’ve never done enough. I struggle with this in other areas of my life, too, but this reality in my mothering life — yeah, that pretty much gets me right in my heart’s center. They’ve got loads of physical needs, sure, and it’s hard enough to stay right here to wash another load of laundry or prepare the next meal, but it’s the emotional pouring that often leaves me most weary. The desire to make sure they feel heard and valued and loved and safe and know the goodness of God — though it is not fully in my power to make sure they receive these truths — as their mama, the weight presses. I am not ensured they will know because I’ve told them enough “I love you” or “I believe in you” or “God is with you” (though this certainly matters, and I pray they will know these things in the deepest of ways). Really, each will have her own way of processing this family system and her inner life and her relationship with the Maker. What speaks to one may miss another. What buries the seeds of these lessons deep within might be ground tilled by pain or sorrow. And I have so little control of all this. “You might be so focused on teaching and pouring out to make sure they feel safe and loved and know home is a good place that you are not receiving it yourself,” she said. Perhaps you’ve walked a painful journey to where you are right now, and it’s hard for you to receive the good of what is. Perhaps your right here stinks foul mess. Perhaps you’ve known peace and are continually able to catch glints of light and see what is good. Friends, wherever you are, if there is one place today where you purpose to love, to serve, to bless, then I pray you might be able to not only give it, but receive a touch of the right here truth that the good in this is for you, too. Yes, rest just a moment in that. This is Day 1 of Right Here. (I didn’t actually think I was going to write today, but I changed my mind.) 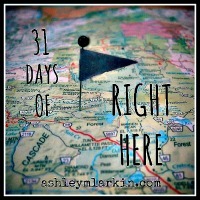 I’m calling yesterday’s post, Welcome to 31 Days of Right Here, an introduction to the series. To read all posts in 31 Days of Right Here, click here. To continue receiving these daily words, subscribe to this blog on the sidebar at left, click here to Like Draw Near on Facebook or follow me on Twitter @AshleyMLarkin. Also linking today with The Extraordinary Ordinary and Just Write. This feels like a revelation to me…I’m going to be thinking about it all day. I heard her and kinda thought, “oh yeah, I think I knew that.” But…yeah, not so much. I’m letting it soak deeper this week. I’m glad it’s got you thinking, too. I don’t really have words but you’ve got me thinking, friend. Can’t wait to dig into your 31 days! Thank you, honey. Great to have you here. Hope you’re feeling much better. “This is for YOU too.” It seems too easy to forget something as important as that, doesn’t it? (And to think: all right here!) Thank heavens for simple brilliance from good friends! I am grateful for sure! This is going to be good. Just like the one who holds the pen. Good and soulfull. Love you love this. Thank you, dear Elizabeth. I love that we are walking in step on this journey. Oh yes, your friend’s advice is excellent. Always remember, dear one, that we cannot give what we do not have and that goes for mothering as well. We need to receive Pappa’s love and grace to the overflow to really be authentic in all the loving we do! Oh yes, I know it’s true, but sometimes forget all the WAYS it’s true, if you know what I mean. Thank you for the reminder that this applies to all things, Mia. Oh girl… I am with Alia… and I think that for most of your #31Days here… I will simply be saying I love you… followed by a hearty Yes and Amen! This 31 Days is some kinda crazy. I can’t believe you did one for each of your blogs last year! Your love, yeses and amens mean a lot to me, Karrilee. I’m so sorry for your day today, Dee Dee. I have been praying for you — that you would receive all you’re pouring out today. That you would know grace, love, boundaries, strength, peace…and the God who lifts you when you don’t have a thing left in the tank. Sending much love to you. Tears. It reminds me of a teary real life conversation we had about us and our kids. I don’t remember this is for me too. Thanks for the reminder. And I plan to come back often this month. I’m ready for what’s right here. Oh, friend, me too. Thank you for your companionship along the journey. Grateful. Having a revelation, a big one, right here, right now. Thank you for this. I needed this. My children need me to know this, to live this. I know exactly what you mean, Sis: “My children need me to know this, to live this.” Let’s talk more when we see each other about what this means to walk out. I need it, too. Lots. So sweet these words to me. Perfume and incense…I love that! 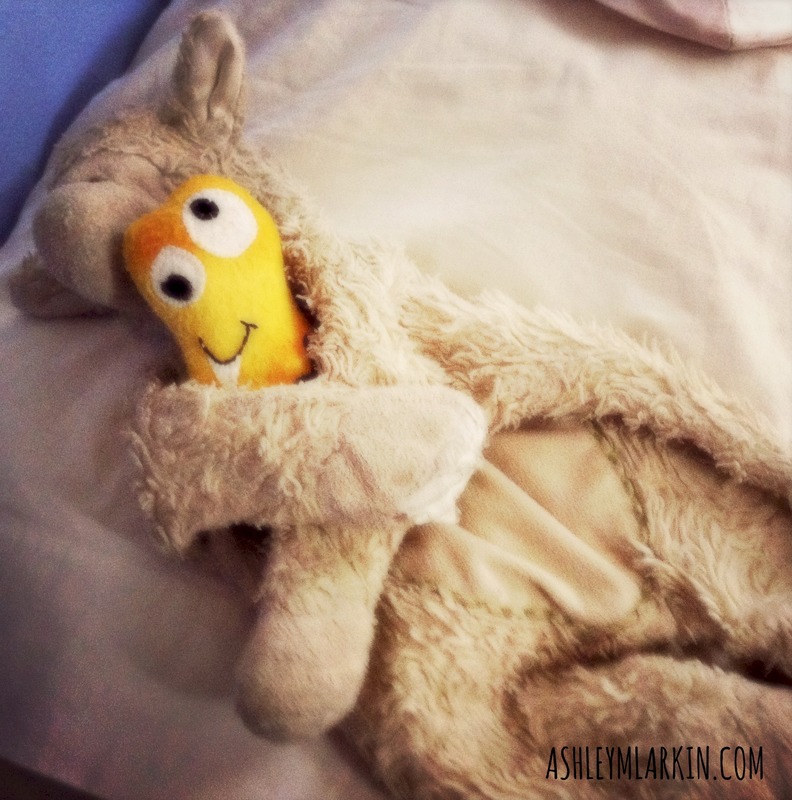 Wise words from your friend, Ashley… thank you for sending them our way. It must especially be true for moms, that it’s so easy to forget that all this that you’re trying to give and impart to them is for you, too – from your Father, your Maker. I want to receive that. Praying today that you are receiving the love and peace and tenderness you give. I love you, Amber.